Michael: Let's get started....here's the first jam track. Michael: We'll start in A, Zakk uses the minor pentatonic/blues scales quite a bit. Here's the pattern. Marko: Do you need special pickups to get it to sound like that? Michael: Here's another run Zakk uses. This run uses the A minor blues pattern. 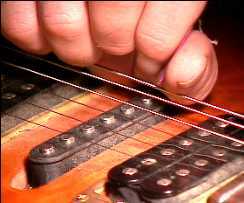 If the lick is too fast for you use the Riff tools to slow it down. How are you all doing? John: I do better picking with the thumb hitting the string for the harmonic. Michael: Here's another lick using the same pattern. 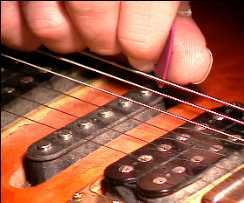 It's starts in the lower position of the extended A Minor Pentatonic pattern and then climbs to the middle position of the scale using your 3rd finger for the slide helps you make the transition in the scale pattern. Michael: You hear chord changes like this often in Ozzy's songs. It's a great tool for guitarist to use more of the fretboard when playing a solo and make the solo sound more interesting. 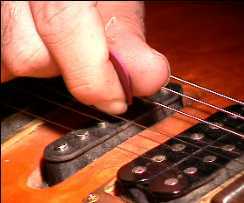 Here's the other technique for "harmonic picking," in this technique you hit the pick first then immediately your thumb. Michael: This technique works better when playing on the lower strings. Michael: This works great for many players. I got a blister using this technique, because I haven't used it in quite awhile and it sounds awesome with a lot of distortion. Marko: do people ever get harmonics on the upstroke? Michael: Sure Marko, the secret is to make contact twice.... either with the pick then finger or finger then pick. It has something to do with striking the note then stopping the vibration. Marko: The only way I can get the sound is to hit the string with the finger and pick at the same time. Michael: Marko you do make contact with one or the other first, one starts the note, the second reduces the vibration to create the harmonic sound. 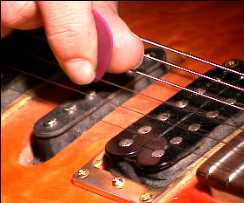 In the video I demonstrate the sweet spots for picking harmonics. mehl: I can see how you got the blister, fingers starting to hurt. Michael: Now here's the full jam track using the A and F# together. Michael: Here's how the entire track showing how most of the licks work together, this will help you to compare. Michael: Question: did you know George Lynch played with Ozzy for one European tour after Randy Rhoads died? I use to play in a band called Jesuit Firebeast (LOL) with George Lynch before he moved to L.A. George was working at the same music store as Randy and was offered the tour after Randy died. Marko: Was that before Dokken? Michael: Yes, George mentioned Ozzy was tripping to much at that time to stay with the gig. Marko: Is that how he became famous? Michael: Actually Dokken was George Lynch's claim to fame, but the Ozzy gig opened the doors for him as a premier guitarist in the L.A. scene during the '80s. Do you know who played with Ozzy after Randy and George? Michael: Brad Gillis of Night Ranger filled in for the live album "Speak of the Devil", Jake E Lee for "Bark at the Moon" & "Ultimate Sin" and then Zakk Wylde for "No Rest for the Wicked," "Just Say Ozzy," & "No More Tears" etc. This brings us to our lesson on Zakk Wylde's guitar secrets. Michael: Time to go. See you at the next next lesson!